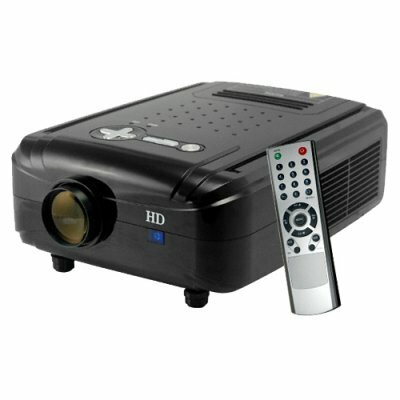 Successfully Added HD Multimedia LCD Projector - 800x600, 1800 Lumens, 500:1 to your Shopping Cart. HD Multimedia LCD Projector - 120 Inch Beauty. Hi-Def LCD Multimedia Projector with HDMI input, the CVSAK-3302 is a complete projector solution for either productivity (teaching, meetings, etc.) or entertainment. This versatile HD (high definition) model has multiple video input options and projects an image size up to 120 inches. Often used in sports restaurants, classrooms, or home theaters, this unit is also suited well for office presentations when crisp images or multimedia files will be shown. Projectors are a great way to get big screen sizes without the need for the dedicated floorspace, and the CVSAK-3302 is a step above the rest with its HDTV support and robust feature set. This LCD projector is perfect either for the resale market, OEM market, or personal/company use. Brought to you from your source for wholesale direct from China electronic products, Chinavasion. Hi-Def LCD Multimedia Projector for productivity or entertainment. Crisp wall or screen image size up to 120 inches (300 cm). This projector is fitted with a 220-240V power supply. No. This projector uses a 220-240V power supply whereas power outlets in the US deliver 100-120V. If you are interested in a 100-120V version of this projector and will be ordering at least 5 units though, please contact our customer service team. This is one of the best products i have bought in a long time. Quality is great. I removed my TV from my living room and use it every day to watch tv. You won't be sorry.